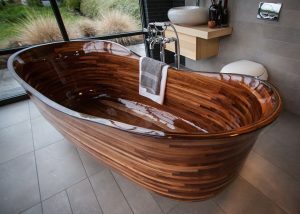 A former boat builder has transferred his skill to the design of unbelievably beautiful bathtubs. 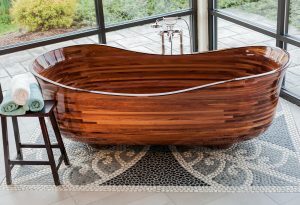 Each of his bathtub masterpieces are handcrafted from sustainable domestic and exotic hardwoods and then sealed with a specialized finish that makes them shiny, smooth and waterproof. “Why wood? It is not petroleum-based, casted or a refined product that involves massive amounts of energy to create,” Katz tells Iconic Life magazine. 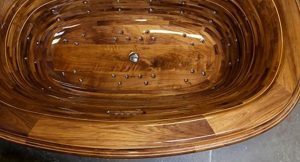 The tubs are maintenance-free and unaffected by humidity, dryness, or common cleaning products, according to his website NKWoodworking.com. 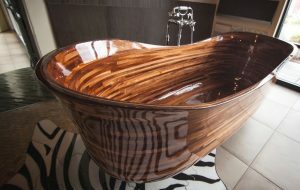 And because wood insulates better than metal or porcelain, the tubs keep the water hot longer.